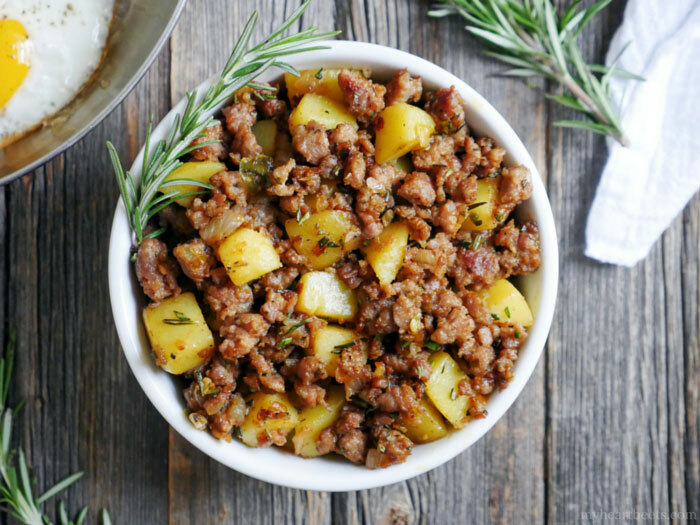 This spicy rosemary sausage and potato breakfast hash is absolutely going to elevate your breakfast game. 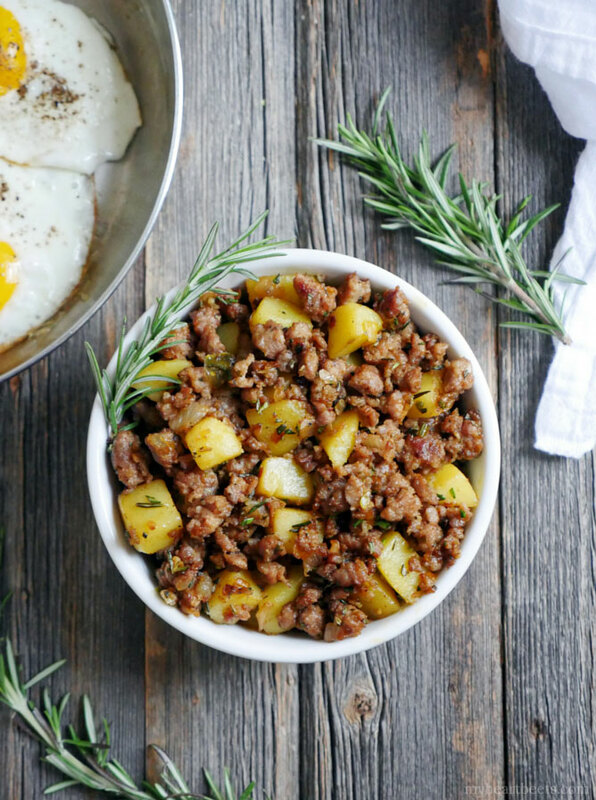 Serve this to family, friends, guests and rest assured that this flavor bomb breakfast hash will definitely impress. Let me share a little tip with you… when you’re in need of a breakfast hash recipe, do not type out the word “hash” in your search engine. Why? Because you will end up with a list of results that’s completely different than what you were intending. (Yes, I’m 100 percent speaking from experience). I especially don’t recommend it when using a work computer. 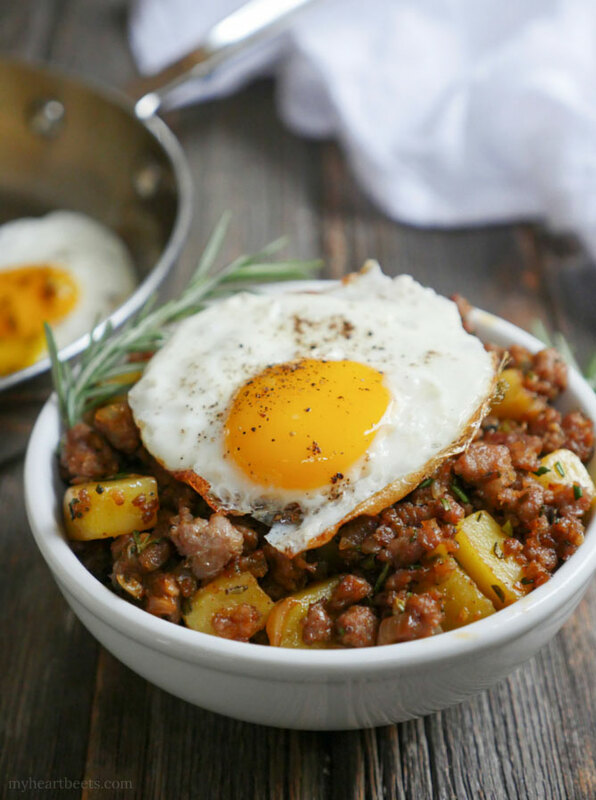 This hash – excuse me – breakfast hash is fullll of flavor. And not just a teeny tiny baby pinch of flavor. I’m talkin’ BIG flavor. HUGE. And please don’t get me wrong, when I say flavor, I don’t mean that this is super spicy – it’s moderately spicy, but if you’re not a fan of heat, you can easily adapt the recipe by removing the rib from the serrano pepper or by nixing it completely. When I say flavor, I mean the way that the ingredients and spices blend together in this dish. The garlic, paprika and fresh rosemary come together in a way that only they can, you know? I love using fresh rosemary in everything that I make this time of year. It’s so fragrant and woodsy and I know other people might tell you to only use a little because it’s so strong… but not me. Most recipes call for what, a mere teaspoon? BAH. I’ll take that teaspoon and make it a TABLESPOON. No, not enough. Let’s make it TWO tablespoons. (Um, based on my cooking methods, I’m pretty sure I’d have a gambling problem if I was a gambler). So yes. This breakfast calls for TWO tablespoons of fresh rosemary. And even that might not be enough. (I’m kidding, it’s enough… ). Don’t make a bland and boring hash. 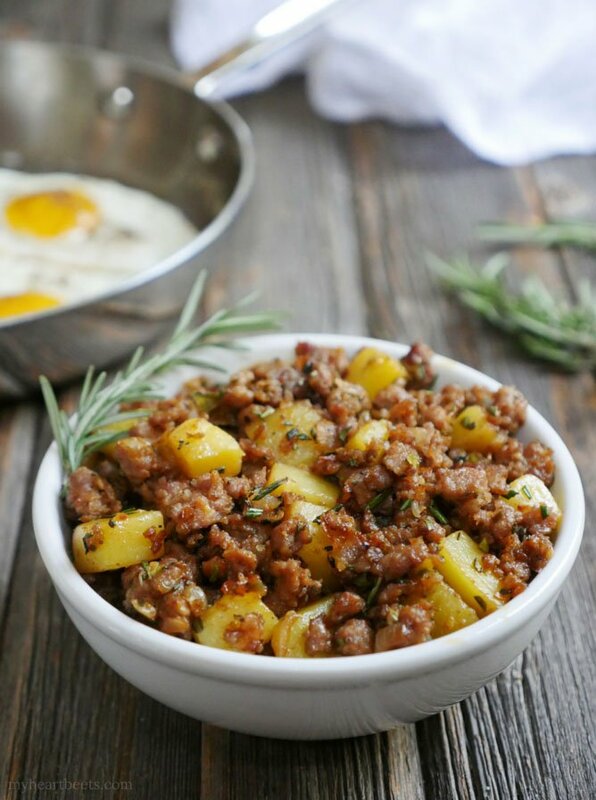 Make a flavorful hash. 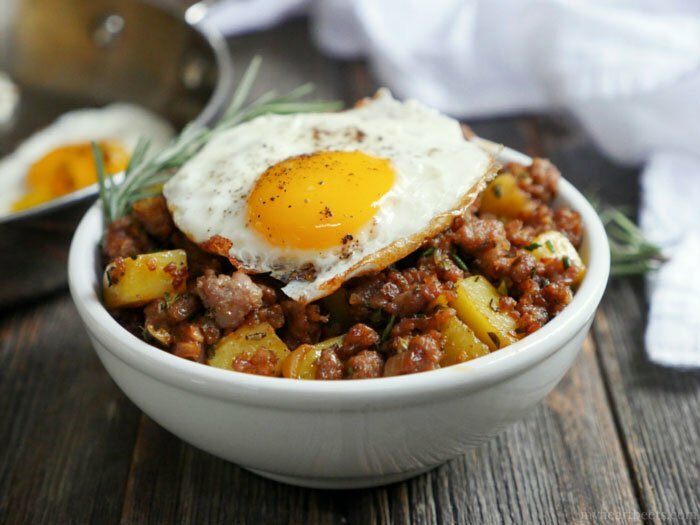 Breakfast hash, that is. Next, add the onion and serrano pepper and stir for 5 minutes, or until the onions have softened. Add the sausage and garlic and cook until the meat is no longer pink. Add the potatoes, 1 tablespoon of the rosemary and any remaining spices. Cook for 10 minutes or until the potatoes become fork tender. Add the remaining 1 tablespoon of rosemary, mix well and serve. Doesn’t everything look better with a fried egg on top? 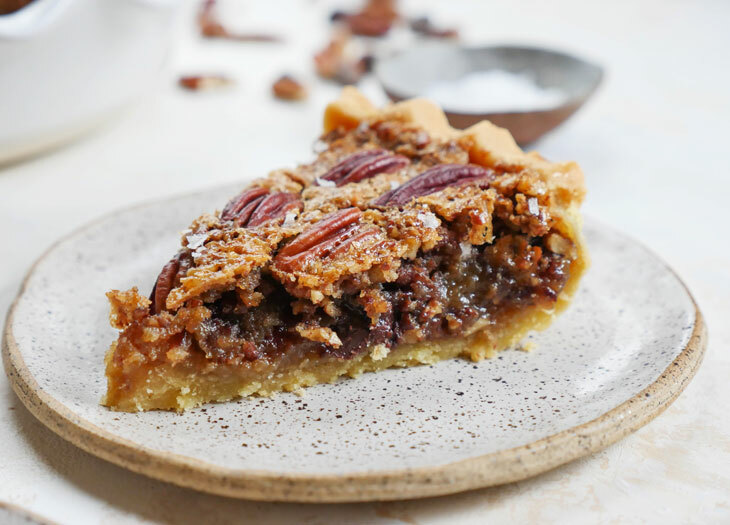 Okay, maybe not desserts… mayyybe (okay, definitely). 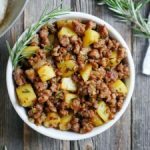 I make breakfast hash all the time but never thought to add rosemary. I don’t usually cook with it but for some reason grew it this year and just threw it in my freezer. 🙂 Now I have a reason to use it and will give this version a try! Sounds delicious. I can’t eat potatoes(nightshade) so will try with sweet potato. Do you think I can just substitute and follow recipe? Hi! This is my first time visiting this blog. I found it by searching for non-egg breakfast recipes. As much as I try, I cannot make myself love eggs. 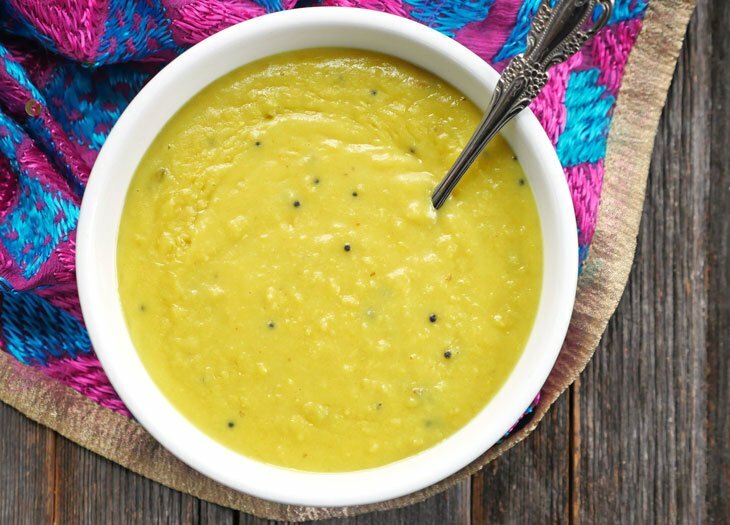 This recipe is the answer to all of my prayers. 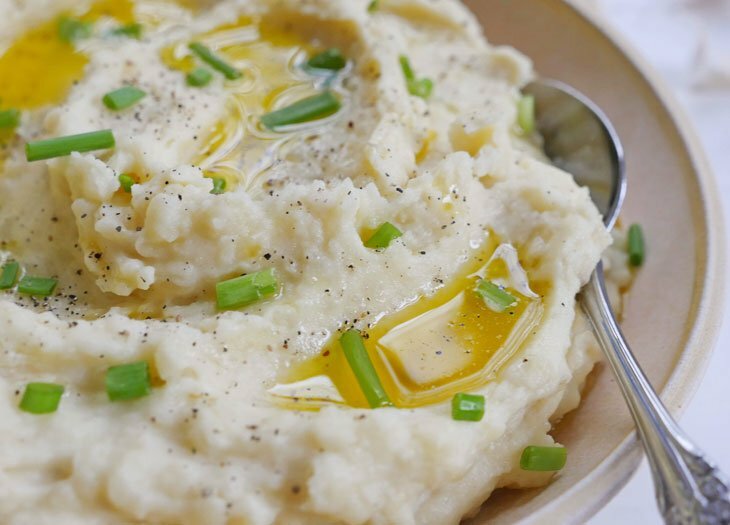 It isn’t filling, delicious, and simple to make with great ingredients! Thank you so much for this!